"Fortune Favors the Brave" and "fight tonight"
2nd Battalion, 3rd Marines (2/3) is an infantry battalion in the United States Marine Corps based out of Marine Corps Base Hawaii consisting of approximately 1000 Marines and sailors. The battalion falls under the command of the 3rd Marine Regiment and the 3rd Marine Division. The 3rd Training Battalion, Division Special Troops, 1st Marine Division was activated on May 1, 1942, at New River, North Carolina. On June 17 of that same year, they were redesignated the "2d Training Battalion, 3rd Marines" and in September were deployed to Tutuila, American Samoa and reassigned to the 2d Marine Brigade. They remained there until they moved to Auckland, New Zealand in May 1943. In June of that year, they were reassigned to the 3d Marine Division and were again moved to Guadalcanal in July. 2/3 deployed to Da Nang in the Republic of Vietnam in April 1965. They fought in Vietnam from April 1965 until October 1969, operating from DaNang, Camp Carroll, Quảng Trị, Cam Lộ, the A Shau Valley and Khe Sanh. The battalion made a night helicopter assault into the Elephant Valley south of Da Nang on 12 August 1965, shortly after Marine ground troops arrived in the country. In April 1967, 2/3 was flown to Khe Sanh and walked north up into the DMZ and participated in one of the bloodiest fights, later to be known as The Hill Fights. In October 1969, the battalion relocated to MCB Camp Pendleton. In January 1991, under the command of Lt. Col. Robert B. Blose, 2d Battalion/3rd Marines deployed to Saudi Arabia and participated in Operation Desert Storm and the Liberation of Kuwait. The battalion was deployed to Southwest Asia from January to April 1991, when 2/3 returned to Kaneohe Bay. The battalion deployed in support of Operation Enduring Freedom in the Konar and Laghman regions in north eastern Afghanistan in 2005-2006. 2/3 suffered 4 KIAs. 2/3 deployed in support of Operation Iraqi Freedom in the Haditha region of Al Anbar Province in western Iraq in 2006-2007. 2/3 faced some of the worst fighting in the entire war. They were one of the last Marine units to face combat in Al Anbar. 2/3 suffered 23 KIAs from September 2006 to April 2007 and was given the nickname of "The Angels of Anbar." In February 2008, the battalion again deployed to Iraq, operating in the vicinity of Fallujah. On June 26, 2008, the commanding officer of 2/3, LtCol Max Galeai and two other Marines (Captain Philip J. Dykeman and Cpl. Marcus W. Preudhomme) from the battalion were killed when a suicide bomber dressed as an Iraqi policeman detonated an explosive vest at a meeting of tribal sheiks in the town of Karmah. The battalion returned from this deployment in late August/early September 2008. 2/3 Deployed to Afghanistan in 2009 (14 KIA) as part of the 2nd Marine Expeditionary Brigade. They were part of the 17,000 troop increase announced by President Obama in mid-February. 2/3 returned to Marine Corps Base Hawaii late 2009, and redeployed to Afghanistan in November 2010 to Helmand province to the Nawa-I-Barakzayi District. During this deployment, due to increased security in Nawa, Fox Company was attached to 3rd Battalion 9th Marines in Marjah, during less than 6 months the Company found over 270+ weapons caches & IED's, more than any other Marine Company deployed to Afghanistan. Because it was so kinetic a PMT from 2/3 (police mentoring team) was attached to 3/5 (Sangin, Afghanistan) during the 2010 deployment. 2/3 returned from Afghanistan in June 2011. In April 2012 Fox Company was the first US military unit to begin regular training rotations through northern Australia. It is expected that eventually 2500 US Marines will be posted near Darwin, Northern Territory with the 5th Battalion, Royal Australian Regiment, as part of increased security ties between the two nations (See Australia–United States relations). During World War II, PFC Leonard F. Mason, serving with the 2/3, despite being mortally wounded, single-handedly destroyed an enemy machine gun position during the Battle of Guam. Mason was posthumously awarded the Medal of Honor. During the Vietnam War, PFC Bruce W. Carter threw himself on a grenade to save the lives of fellow Marines. He was posthumously awarded the Medal of Honor. During the Vietnam War, Staff Sergeant Peter S. Connor was awarded the MOH (posthumously) for actions on 25 February 1966. During the Vietnam War, Private First Class James Anderson, Jr. was awarded the MOH (posthumously) for actions on 28 February 1967. James L. Jones Jr. In 1967 as a 2nd Lieutenant, James L. Jones Jr. was Platoon Commander of 1st Platoon, Golf Company and after the Tet Offensive in 1968 became Company Commander of Golf Company. Later Jones went on to become Commandant of the Marine Corps. Wikimedia Commons has media related to Category:2nd Battalion 3rd Marines. ↑ "MarineLInk". United States Marine Corps. Archived from the original on 2007-09-30. https://web.archive.org/web/20070930201716/http://www.marines.mil/marinelink/mcn2000.nsf/main5/069DED4D1870A99F8525727800361719?opendocument. Retrieved August 15, 2008. "2/3 faced some of the worst fighting in the entire war. They were one of the last Marine units to face combat in Al Anbar. 2/3 suffered 23 KIAs from September 2006 to April 2007 and was given the nickname of "The Angels of Anbar"." ↑ Vorsino, Mary (2008-06-28). "Suicide bomber kills 3 Hawaii Marines - Battalion commander among suicide bomber's victims". The Honolulu Advertiser. http://www.honoluluadvertiser.com/apps/pbcs.dll/article?AID=/20080628/NEWS08/806280336/1001/LOCALNEWSFRONT. Retrieved 2008-06-28. ↑ "2/3 begins return to Hawaii from Iraq". Marine Corps Times. 2008-08-14. http://www.marinecorpstimes.com/news/2008/08/marine_hawaiireturn_081408/. Retrieved 2008-08-15. ↑ Hlad, Jennifer (2008-03-09). "2/8, other Lejeune units to deploy with 2nd MEB". www.enctoday.com. Archived from the original on 14 March 2009. https://web.archive.org/web/20090314220903/http://www.enctoday.com/news/2nd_62892_jdn__article.html/meb_expeditionary.html. Retrieved 2009-03-09. ↑ Page, Susan (2009-02-16). "Obama OKs adding Afghanistan forces". USA Today. https://www.usatoday.com/news/world/2009-02-17-afghanistan-forces_N.htm?csp=34. Retrieved April 23, 2010. ↑ Stence, Jesse (August 30, 2011). "Healing the Bleeding Ulcer: A Hopeful Prognosis in Southern Helmand". International Security Assistance Force Afghanistan. http://www.isaf.nato.int/article/news/healing-the-bleeding-ulcer-a-hopeful-prognosis-in-southern-helmand-province.html. All battalions are part of other regiments in 1st Marine Division, the regiment in turn hosts units training at the Jungle Warfare Training Center. 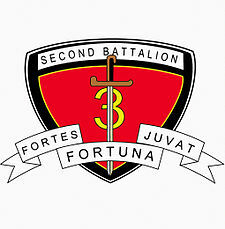 All battalions are part of other regiments in 2nd Marine Division.